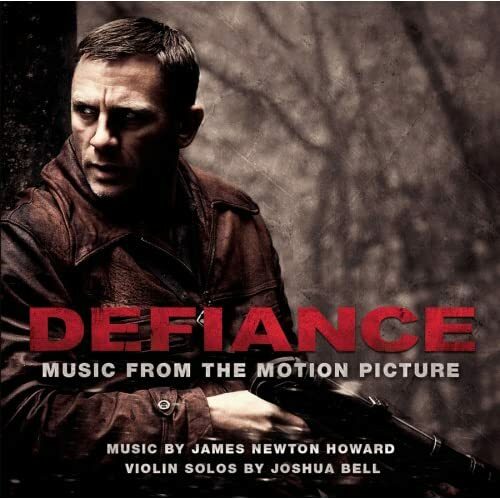 Although world renowned violinist Joshua Bell notes that he doesn't normally contribute to many film scores, filmmaker Edward Zwick's upcoming World War II film Defiance held a personal interest for the virtuoso. "I come from a Jewish heritage," he explained in the Sony BMG press release, elaborating that, "my grandmother lived very close to where the story takes place-- yet I was shocked that I'd never heard this story. It was eye opening for me." To score the epic true story of three brothers (played by Daniel Craig, Liev Schreiber and Jamie Bell) who escape massacre and decide to "avenge the deaths of their loved ones by saving thousands of others," filmmaker Edward Zwick called upon the seven-time Oscar nominated composer James Newton Howard, with whom he'd collaborated on a previous film, Blood Diamond. To honor the lost artists who perished during the Holocaust, Zwick made a decision to strive for a score "that was not only appropriate historically but also emotionally appropriate." And as "the sound of the violin is central to Eastern European Jewish culture; it is the sound of what was lost. And so it became the centerpiece, with everything else embroidered around it." Taking what he described as "a minimalist approach, with the score's melodies rooted in simple harmonies," Howard found precisely the right musician to use his bow to elicit great sadness, unexpected joy, romance, courage and more with Bell who agreed with Zwick's importance on the instrument for this story in particular, observing that the strings of a violin produce "a sound that goes straight to the heart." Yet while Howard is modest about his work, claiming that Bell "took the score and made it a thousand times beter," by offering up solos in all but two of the fifteen tracks included on the Sony soundtrack, intriguingly on the first listen, I didn't do any research beforehand and discovered that the track that had the greatest impact on me as a listener was "The Bielski Otriad," which incidentally is one of the two that does not feature a Bell solo. An epic piece of composition that works in movements, satisfying our ears by providing numerous phrases which are used elsewhere on the album but putting them together to craft a more complicated work-- it begins with an eerie, dark foreshadowing that's followed by a peculiar use of high timpani or bells until it builds into identifiable rhythm that welcomes the rushing strings which join in nearly three minutes into the track, changing emotional tone numerous times throughout. Yet, as promised-- the violin is the major star of the album with Bell incorporating his most contemplative and mournful sound in the all too brief second track "Survivors" (sadly one of many that-- true to the soundtrack form-- end far too quickly). Using what seems to be external ambient noises like a train or ticking, Howard surprises us throughout, which is a benefit as unfortunately a few too many of the tracks sound way too similar and even with the best speakers, you'll need to crank the album fairly loudly to distinguish one from the next. While overall, it's a somber and extremely serious sounding score that fits in well with its cinematic companion as we can nearly picture some of the intense action occuring as "Bella and Zus" begins with a somber masculine bass that evolves into a beautiful blend of other orchestral instruments and percussion until the anticipation pushes the piece to a driving climax that ends abruptly, with the much more romantic yet bittersweet "Exodus" taking over. Returning to some of the main themes heard earlier in "Nothing is Impossible,"somehow the music has become far more soulful as it nears its conclusion and due to the gravity of the piece, it's perhaps not an album you'd want to listen to too many times as it seems both hauntingly beautiful yet equally mororse. However, it's still an outstanding achievement and collaboration of Howard and Bell that's a treat for their mutual and definatly dedicated fans.